Another quality eBook from Chapel Library. THE PILGRIM’S PROGRESS traces the journey of Christian from his first conviction of sin, through his conversion, trials, suffering, and victorious joy, and ultimately across the River of Death to the Celestial City. 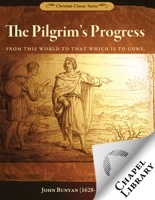 Next to the Bible, the book that I value most is Pilgrim’s Progress. I believe I have read it through at least a hundred times…Prick him anywhere, and you will find that his blood is “bibline,” the very essence of the Bible flows from him. – Charles H. Spurgeon (1834-1892) JOHN BUNYAN (1628-1688) was born of a poor family near Bedford, England. He repaired pots and pans before being called to preach the Gospel full time. He was imprisoned in 1660 for refusing to compromise with the practices of the Church of England. While in jail for 12 years, he penned The Pilgrim’s Progress, which has been in continuous print since then and is the second best selling book of all time after the Holy Bible.